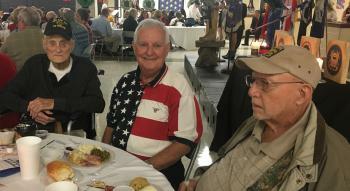 Article: Veterans Day Luncheon Thank You! Veterans Day Luncheon Thank You! W O W ! What a great day and what a great event. Thank you for the warm welcome, a great program, good food and a group of fine young people who were welcoming, helpful throughout the entire event, and entertaining. Even the picture of three old veterans was taken by one of the student dancers, Anna King. We were each impressed with the smiling happy students who waved us into the parking lot, helped us from the car, rolled my friend up to the dining room in his wheelchair and helped us get seated. The leadership involved with the details were amazing. The students were well trained and did an excellent job and we felt genuinely appreciated for our service. Thank you for your hard work. Leo Childers USMC 94, Clem Wixted USAF 77, James Prescott US Army 83.